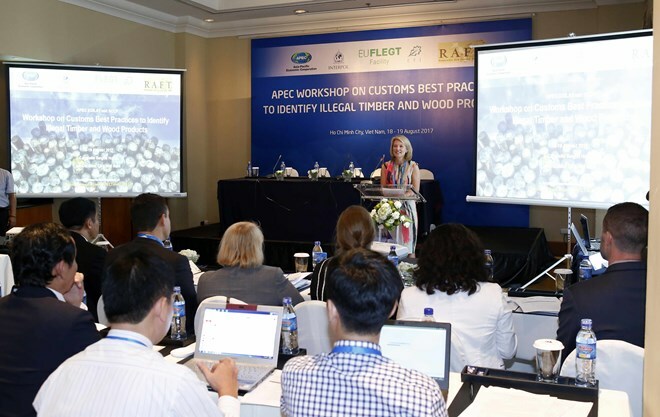 HCM City (VNA) – An APEC workshop was held in Ho Chi Minh City on August 18 with a focus on customs best practices to identify illegal timber and wood products. The function was held by the APEC Experts Group on Illegal Logging and Associated Trade as part of the third APEC Senior Officials’ Meeting (SOM 3). Statistics of the International Trade Centre (ITC) show that global wood and furniture exports respectively reached 127 billion USD and 233 billion USD in 2016, rising by 7.9 percent and 10.8 percent from 2012. Forests in APEC economies account for 53 percent of the world’s forest area. The region also makes up 60 percent of the global timber and wood products output and 80 percent of the global timber and wood products trade. This fact shows that APEC plays a critical role in promoting sustainable forest management and legal timber trade in the world. However, illegal wood trade is now a worrying issue, reportedly accounting for 10-30 percent or 100-300 billion USD of global wood trade each year. Jennifer Prescott from the US Trade Representative Office said it is very important to control illicit wood products business activities since these activities will lead to forest degradation and the loss of biodiversity, threaten local livelihoods, and result in very serious social, political and economic consequences. Illegal wood trade has become complicated, requiring APEC economies to together create stricter control tools to solve the problem, she added. Nguyen Van Ha, Deputy General Director of the Vietnam Administration of Forestry, said with both wood export and import activities, the country has continually enhanced measures to prevent illegal wood trade. The conclusion of negotiations on the Voluntary Partnership Agreement on the Forest Law Enforcement, Governance and Trade Action Plan with the EU last May is an illustration of Vietnam’s commitment to building a timber legality assurance system. An effective measure that Vietnam has taken to prevent illegal wood trade is stepping up the customs force’s anti-smuggling activities. Its customs agencies have increased managing imported wood, collecting information about businesses with violations in wood business, and classifying firms with high risks of illegal wood trade so as to have timely control measures. They have also paid attention to international cooperation to exchange information serving the fight against wood and wildlife smuggling, Ha noted.